A Ken Baker shot from the Program photo session for ‘Anything Goes’ January 1982. Either we were just goofing around after the shoot or Ken was testing the lighting. Either way, I think I should have stuck with that look – Peter Frampton hair and black bow tie. 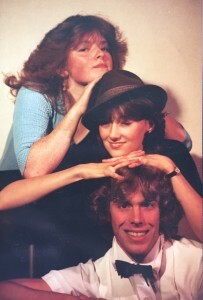 Zsuzsy Rackozy, Jill Wyness and Dave Goossen.